For the compact disc standards series, see Rainbow Books. For pre-Internet communications protocols, see Coloured Book protocols. 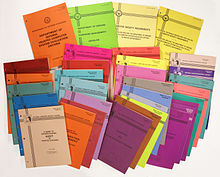 The Rainbow Series (sometimes known as the Rainbow Books) is a series of computer security standards and guidelines published by the United States government in the 1980s and 1990s. They were originally published by the U.S. Department of Defense Computer Security Center, and then by the National Computer Security Center. These standards describe a process of evaluation for trusted systems. In some cases, U.S. government entities (as well as private firms) would require formal validation of computer technology using this process as part of their procurement criteria. Many of these standards have influenced, and have been superseded by, the Common Criteria. The books have nicknames based on the color of its cover. For example, the Trusted Computer System Evaluation Criteria was referred to as "The Orange Book." In the book entitled Applied Cryptography, security expert Bruce Schneier states of NCSC-TG-021 that he "can't even begin to describe the color of [the] cover" and that some of the books in this series have "hideously colored covers." He then goes on to describe how to receive a copy of them, saying "Don't tell them I sent you." This page was last edited on 22 February 2019, at 18:24 (UTC).